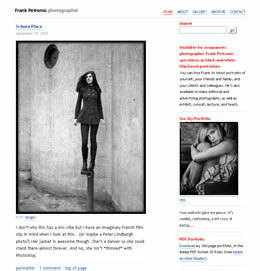 Frank Petronio :: International Portfolio :: PRO IT Service S.R.L. - Choose a professional and accessible service for your online image! I first became aware of PRO IT Service when it helped me out of a jam pro bono. I was immediately impressed by its depth of knowledge about Movable Type and MySQL, so after getting past the crisis, I hired PRO IT Service to help me upgrade a client with a customized Movable Type installation. Now, I'm about ready to move a huge Movable Type installation to PRO IT Service for hosting. I guess you could say I'm sold on PRO IT Service. Frank Petronio a very talented photographer from New York contacted me and asked for an important fix on his movable type blog. Frank was hosting his blog with Media Temple and had it backed on a Berkeley database. From a certain moment, his Berkeley database became corrupted and he could operate his blog. On September the 20th, 2009 which is two days ago, in my evening, I've got an email from Frank Petronio describing the problem that he had. I am a photographer with the website www.frankpetronio.com. The blog runs on MT v.3, developed in 2005 by Michael, local developer. For 4.5 years it has run flawlessly. "I don't mind doing this work, but the problem is simply daunting. The suggestions of Mike T don't actually help any, though I realize he means well. However, I do like his idea of you contacting Mihai Bocsaru, as he seems to have extensive experience with these kinds of problems (I checked out Mihai's site and was impressed). My suggestion is to talk with him and see what he'd charge to do the MySQL conversion. If you do hire him, he's going to need the credentials for the MySQL database I created for you. You can tell him that that stuff is commented out in the mt-config.cgi file. Also, I'm available to answer questions and help in any way he needs. NOW I am unable to post to my website but I need to for business purposes. Thanks to Mike T, which referred Frank to me I've been able to fix Frank's problem and to have him be able to operate his movable type blog again. Frank indeed had an ugly Berkeley database failure! After some investigation I've found the issue, I've isolated it and then I've recovered the entire Berkeley database. Then I wanted to make sure that the database is indeed fixed and operable. Moments after, I've started the database migration from Berkeley to mySQL. Starting with Movable Type v4.x the Berkeley database is not longer supported. As a professional I've considered that just converting Frank's database to mySQL, won't be enough. He was running movable type v3.35 which was released about 3 years ago. Since that version was released, Six Apart din an incredible job with Movable Type 4. Movable Type v4 appeared in 2007 and since then we've seen huge efforts from Six Apart crew to make the tool better, more stable, faster and to add to it more and more features. For this consideration I decided to upgrade Frank's movable type installation to the latest version, movable type v4.31 released on the 20th of August, 2009. He turned out to be very nice and helpful. This is really good for me to know. I'll keep him in mind when I'm up against MT stuff I don't know. This kind of feedback is what motivates me to do this kind of work, web development! Contracting from Frank Petronio photographer, Spencerport, New York, U.S.A.